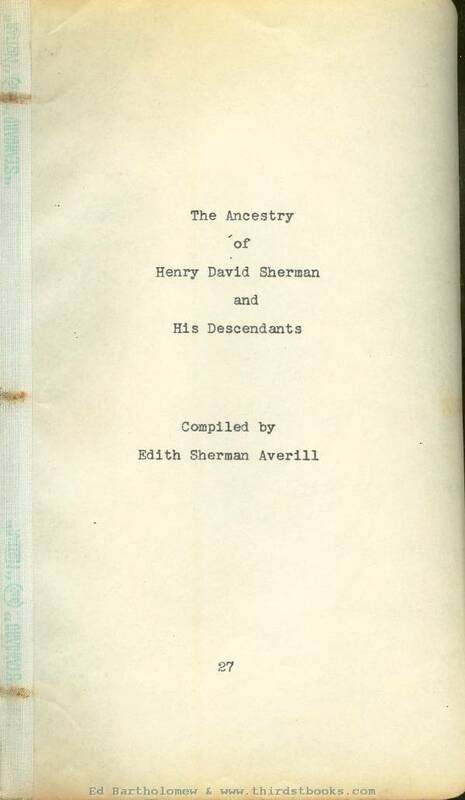 This is an unpublished 84 page booklet created by Edith Sherman Averill in August 1936. It was a treasured part of the estate of Sara Sherman, the youngest daughter of Henry David Sherman. 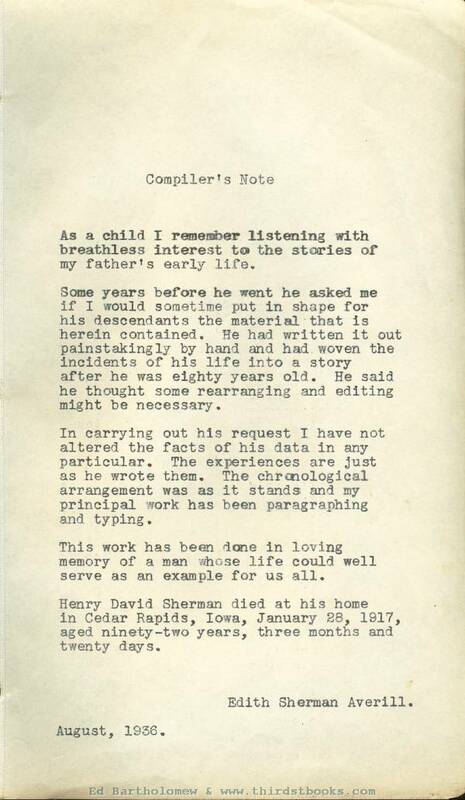 Edith Sherman Averill choose to unline the names of her direct ancestors. ing (singing) but refused to go to church to hear her. One day the telephone rang; Sarah answered it. It was the Captain and he asked Sarah to sing for him over the wire. She turned questioningly to me. Before I could say anything she whispered "He says he would rather hear me sing than anybody he has ever heard except Jenny Lind and just think how hard he has had to work to ask". Thereupon she sang into the receiver, her sweet sympathetic voice unaccompanied, the three stanzas of "Annie Laurie". At its close after a minute’s conversation, she hung up the receiver, turned to me with a bright little giggle, saying - "He says there are tears in his eyes - I didn't ask him whether they were tears of agony or exhaustion". I am finishing these recollections as I enter my eighty-fifth year. Most of my generation are gone. I am grateful to have lived through an era of unprecedented scientific and material development. I have seen the worlds wealth increase unbelievably, have witnessed the growth of the steam railroad almost from its beginning to the great transcontinental lines. The telegraph was not in use until I was a good-sized lad, the telephone came many years later. I was a grown man before the Atlantic Cable was dreamed of. Farming, in my youth done so laboriously with crude implements and no scientific knowledge of the soil, has changed, through mechanical development and chemical investigation, from drudgery to a profession. Improved roads are making Markets accessible to the farmer. 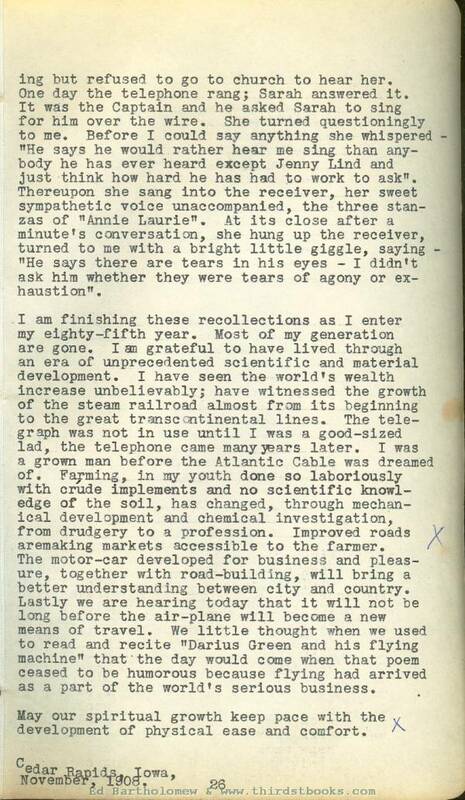 The motor-car developed for business and pleasure, together with road-building, will bring a better understanding between city and country. Lastly we are hearing today that it will not be long before the air-plane will become a new means of travel. We little thought when we used to read and recite "Darius Green and his flying machine" that the day would come when that poem ceased to be humorous because flying had arrived as a part of the world’s serious business. As a child I remember listening with breathless interest to the stories of my father's early life. Some years before he went he asked me if I would sometime put. in shape for his descendants the material that is herein contained. He had written it out painstakingly by hand and had woven the incidents of his life into a story after he was eighty years old. He said he thought some rearranging and editing might be necessary. In carrying out his request I have not altered the facts of his data in any particular. The experiences are just as he wrote them. The chronological arrangement was as it stands and my principal work has been paragraphing and typing. This work has been done in loving memory of a man whose life could well serve as an example for us all. 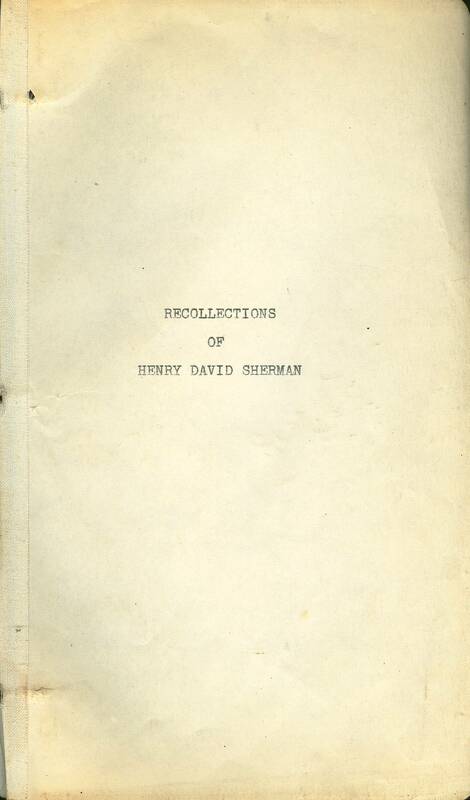 The compiler of this record is indebted to Mr. Thomas Townsend Sherman's work, "Sherman Genealogy", published in 1920, for the material in the following chapter. Mr. Sherman is the foremost authority in this country on his line of the Sherman family in England. 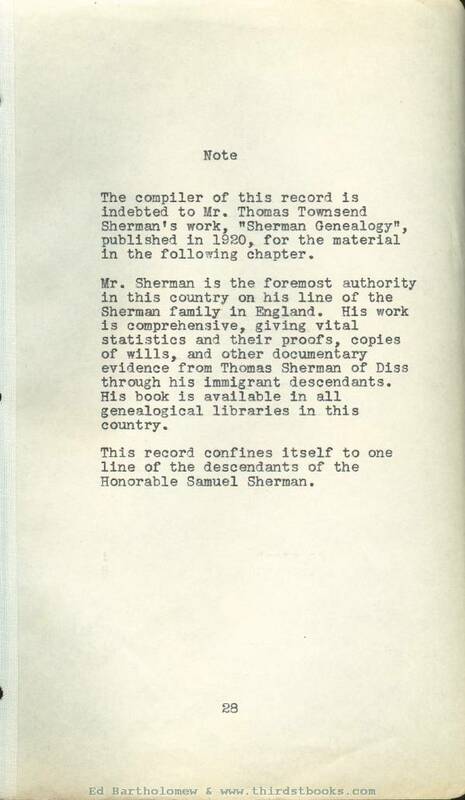 His work is comprehensive, giving vital statistics and their proofs, copies of wills, and other documentary evidence from Thomas Sherman of Diss through his immigrant descendants. His book is available in all genealogical libraries in this country. This record confines itself to one line of the descendants of the Honorable Samuel Sherman. I. THOMAS SHERMAN, of Diss, co. Norfolk; died, 1492-93, at Diss; married Agnes ____, who survived him. i. John (II), m. Agnes Fuller. Agnes, my wife shall have my tenement (except three houses etc.) next the tenement of Agnes Melton, with the croft lying between the land of Thomas Cowper of the one part, and the land in the tenure of Wm. Boby on the other part, for the term of her widowhood; also 8 cows. John, my son, shall have my lands and tenements in Diss and Yaxley to fulfill this my last will. To the Four orders of Friars at Norwich, to each of them, 3s.4d. To Agnes, wife of John Clerk, my godson, a heifer and a calf; to Elizabeth Clerk, a heifer; to each of the daughters of John Sherman, a calf; to Thomas Shereve, my godson, a calf; to each of the sons of John Clerk, a calf. Said John Sherman and John Clerk, residuary legatees and executors. Not witnessed. Proved by John Sherman, with power reserved for a commission to the other executor. II. JOHN SHERMAN, son of Thomas and Agnes (___) Sherman; died, 1504, at Yaxley, co. Suffolk; married Agnes Fuller, daughter of Thomas. She survived him and married, secondly, Robert Hendry. i. Thomas (III), m. Jane Waller. ii. Margery, m. Robert Lockwood, of Eye. To be buried in the parish yard of Yaxley. 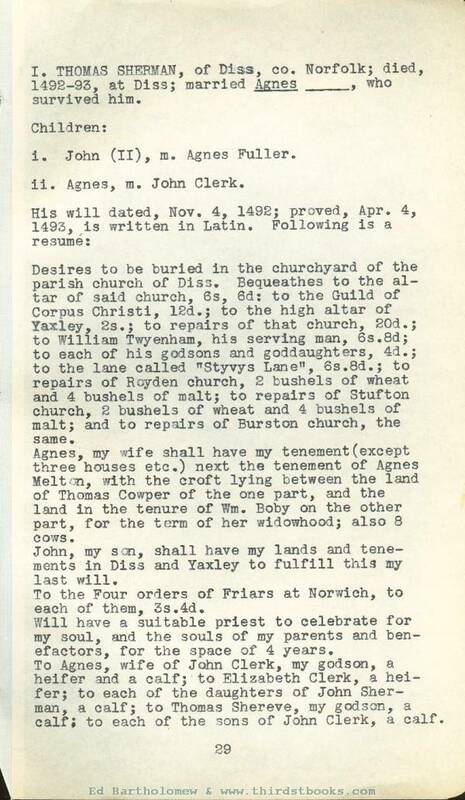 Requests to the church of Yaxley; to the Guild of St. Thomas, of Yaxley; and to the church of Dysse. To wife, Agnes, tenements and lands in Yaxley "wherein I now dwell"; or else, tenements in Dysse, except a close called Elmswell. If wife die before son Thomas becomes twenty-two, lands to be let until that time, and then Thomas to have them, he paying to his sister Margery when she becomes twenty-two years of age, ten pounds. If Margery decease before twenty-two, Thomas to provide a priest a year "to sing for my soul and my friends’ souls", etc. If Thomas decease before twenty-two, tenements and lands to be sold, and Margery, if she live, to have to her marriage twenty pounds. 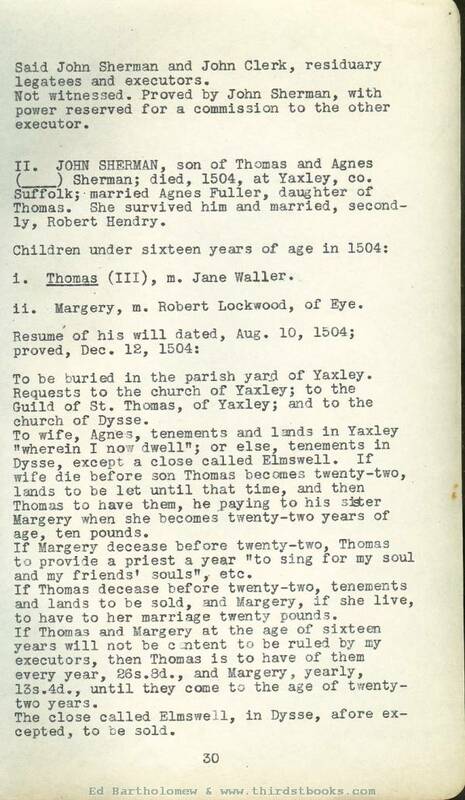 If Thomas and Margery at the age of sixteen years will not be content to be ruled by my executors, then Thomas is to have of them every year, S6s.8d., and Margery, yearly, 13s.4d., until they come to the age of twenty-two years. The close called Elmswell, in Dysse, afore excepted, to be sold.